Before you reach for that little “X” at the top right of your screen, I can explain. 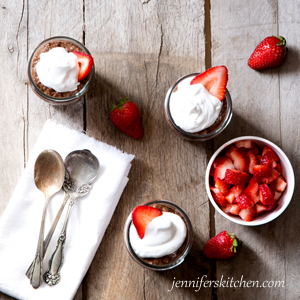 Pudding – one of my favorite desserts – typically uses some sort of highly refined ingredient (like corn starch) to make it thick. Not so healthy. Enter: chia. 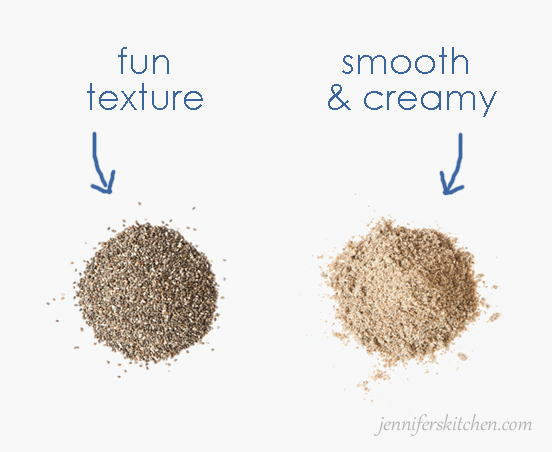 Chia has some super amazing qualities to it, one of which is its thickening ability. Just mix some chia with liquid, wait a few minutes, and it’s thick. 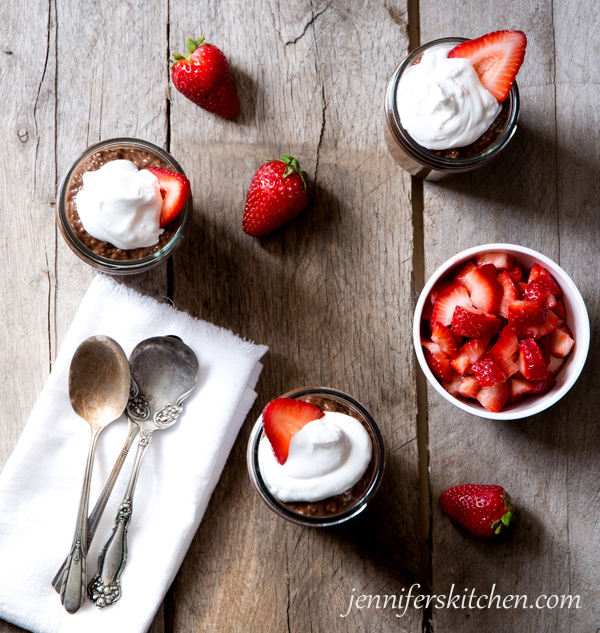 The happy part is that chia is a healthy, whole food – no modified whatchamastarch going on here. 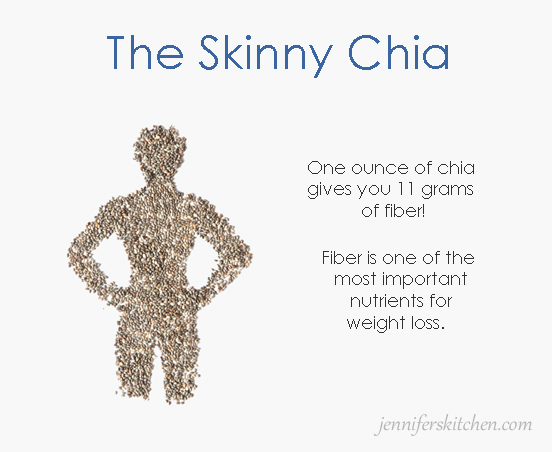 And, unlike most other thickeners, it’s very high in fiber (which is really helpful for weight loss). Taste? 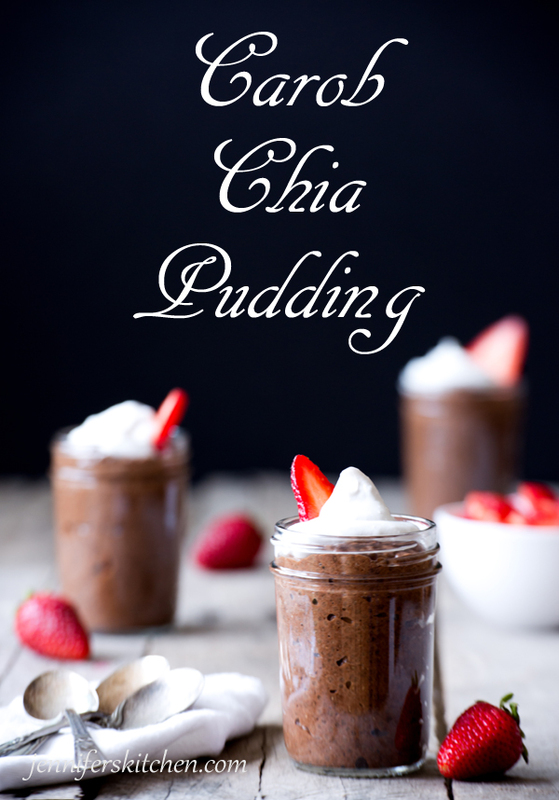 Chia is very mild tasting, so you can incorporated it into just about any recipe and hardly notice. 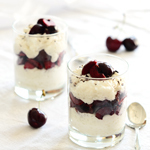 Chia seeds are loaded with fiber which has been shown to help with weight loss and diabetes. Fiber also feeds the good microbes in your gut thereby improving digestion. Chia seeds are naturally gluten free. 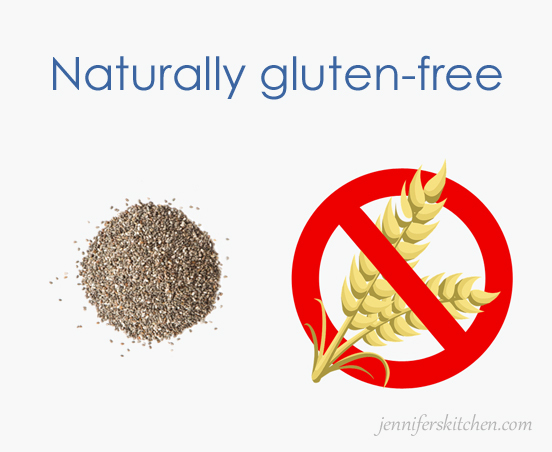 If you are needing to avoid gluten, chia is a healthy option for you. 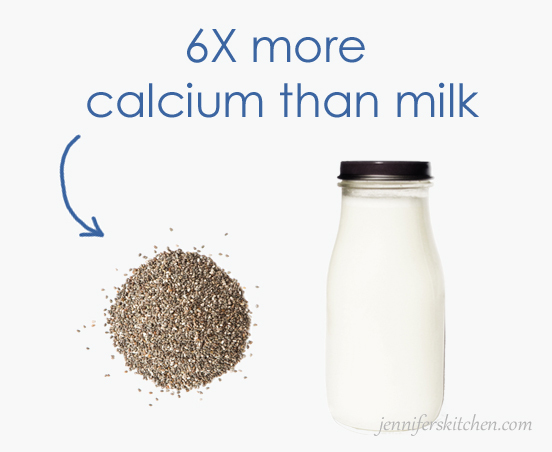 Chia offers more calcium than milk – about six times more! 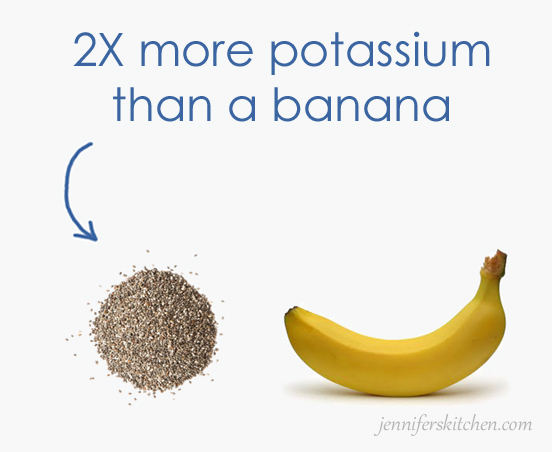 Chia seeds have two times more potassium than bananas. 5. More omega-3 fats than fish. 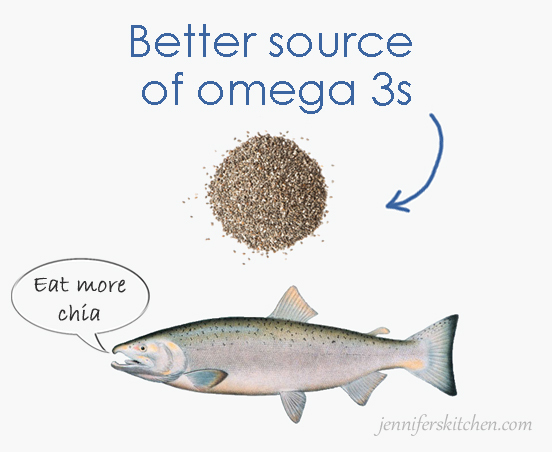 Chia is an excellent source of omega-3 fats. In fact, these little seeds give you more omega-3s than fish! And research shows that women who get their omega-3s from plant sources, like chia, have higher levels of omega-3 fatty acids in their blood than those who get their omega-3s from fish or other animal products. Why? Omega-3s are found in a more stable form, ALA, in vegetables, fruits, and beans. In addition to beating out fish as a source of omega-3’s, chia seeds contain less cholesterol than fish (chia contains zero), and are not tainted with mercury and other environmental toxins as is fish. 6. Chia up. Cholesterol down. 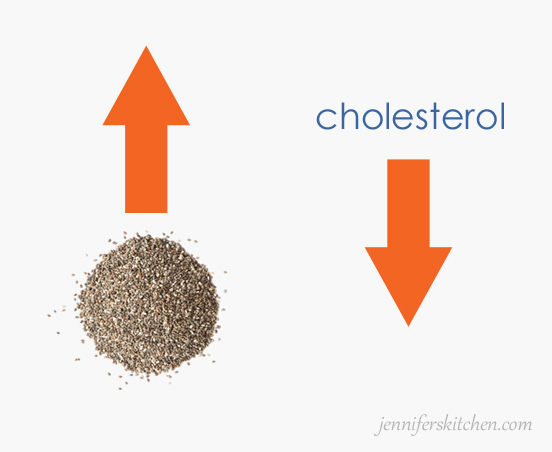 Speaking of cholesterol, research suggests that chia seeds may help increase HDL (good) cholesterol while reducing blood triglycerides. 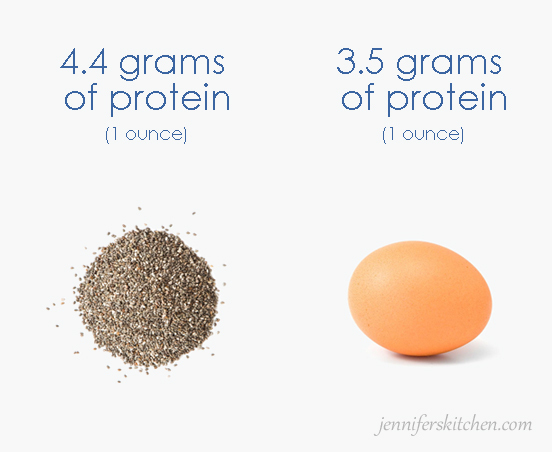 One ounce of chia seeds delivers 4.4 grams protein. If you’re not into the fun, frog-egg texture of whole chia seeds, you can grind them into a powder in a coffee grinder or a blender. 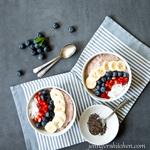 Both carob and chia are good sources of fiber and calcium. Mix together almond milk and chia seed. Set aside. In a saucepan, mix together coconut milk, sugar, and salt (and Teeccino if using) and cook over high heat until sugar is dissolved. (About 2 minutes.) Remove from heat. Mix carob powder into chia and almond milk mixture. If your carob powder is clumpy, sift through a sieve first. Add chia/carob mixture to coconut milk mixture in saucepan. Mix well. Place in refrigerator to chill overnight. If you want your pudding to be super smooth, place ingredients in blender after they have all been combined (step 5) and blend well. Place in frig to chill.I found it interesting that the smooth, blended pudding didn't taste as sweet as the regular chia pudding. You may want a bit of extra sweetener if you blend it. Is chocolate a healthy food? Chocolate does provide some antioxidants, but it also contains many harmful (and potentially addictive) chemicals, including phenylethylamine, theophylline, theobromine, and caffeine. These chemicals have been shown to stress the kidneys, the adrenals, and the liver. They also contribute to lower bone density; cause a loss of vitamin B and vitamin C in the body; increase the risk of diabetes; aggravate PMS; cause migraines and mood swings; and contribute to weight gain. If you want to prevent these health problems, avoid chocolate. 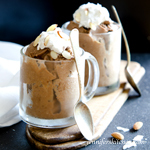 Carob is a much healthier option. 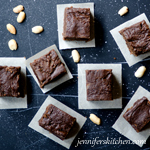 Don’t have any carob on hand? Order it from Amazon and it can be on your doorstep in two days. You can read more about chocolate’s unhealthy effects in a post I wrote here. I just made it for tomorrow breakfast! Thank you for the recipe! 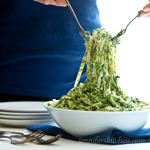 Easy and looks delicious! Thank you for the excellent information on chia seed. When I learned that chia was somewhat calorie dense I thought I wouldn’t be able to use it as much as I like but didn’t realize that it can actually have a weight loss effect. Also, It’s really good to know that it’s so high in calcium, something that’s important for me to get more of. The recipe looks amazing. I have all the ingredients so hope to make it soon. 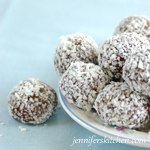 Hi, thanks for the carob chia recipe. I do wish that instead of (or in addition to) providing a link to Amazon for ingredient purchase, there would be a link bringing us to a a recipe for preparing that ingredient from scratch. For instance, I have carob nibs, which I’m thinking I could toast and then grind. I also have a Vitamix and I’m pretty certain I could make my own almond milk. By definition, I like blogs such as yours because I want to prepare plant-based recipes from scratch. Thanks for considering this. Thank you, Lee, for the suggestion. That’s a good idea, and I’ll certainly do that if I’m able. Also, I should mention, I created and tested this recipe with store-bought almond milk (to make it easier for busy people); and, since homemade almond milk turns out quite different than commercial almond milk, the results may not be the same if homemade is used. Thanks again! I hope you enjoy!